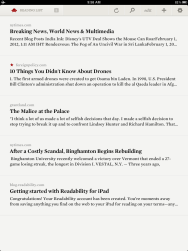 A year after its first attempt was rejected by Apple, Readability on Thursday released its app for iPhone and iPad. The Readability app offers a clutter-free view of text, with options to alter the font, text size, and column width. Apple initially rejected the app because Readability—which lets readers save web articles and view them in a stripped-down, clutter-free format—was attempting to create a subscription model in which publishers and writers would get a cut of its revenues. That didn’t conform to Cupertino’s then-newly announced subscription rules for iOS apps, but the rejection resulted in an angry open letter from Readability’s developers to Apple. The new offering does not offer in-app subscription options. So what does the app offer? If you’re new to Readability, the app is initially a blank slate: There’s nothing to read! You can start to fill your reading list within the app either by browsing directly to a URL or performing a search. Once you’ve found a story you want to read, the app offers two options. You can tap Read Now and be whisked to a stripped-down, distraction-free version of the article or blog post. Or you can tap Read Later and add the item to your reading list. The browser is limited: You can’t bookmark sites that provide your favorite reading material, so you might want to save stories from your desktop or laptop computer using Readability's browser bookmarklet instead. Select a story from your reading list, and Readability defaults to the clutter-free view of the text—but assuming you’re connected to the Internet, you also have the option of viewing the original webpage. (A button also lets you jump to the story in your iOS device’s native Safari browser.) Like other reading apps, Readability offers users the options to choose their favorite font, text size, and column-width for viewing stories. There’s also the standard dark mode, which places light text on a dark background so that you can read in bed without waking your sleeping spouse. And when you’re done with a story, you can swipe right to return to the reading list. Readability lets you save stories on your device, so that you can read them even when you're offline. Stories can be starred as favorites, in which case they’ll live permanently in the app until you unstar them. Other options include trashing or archiving posts—but you must adjust the settings if you want to have automatic access to the archives from within the app; if you don’t turn that function on, old articles will be unavailable, and invisible to the in-app search engine. Stories can also be shared via Facebook, Twitter, or email. In the year since Readability’s first, failed attempt to offer the app, Apple got busy and duplicated some of the app’s features with the launch of iOS 5.0. The native Safari browser on the iPad and iPhone now lets you save stories to a Reading List for later viewing, and also includes a Reader feature that offers a Readability-style, clutter-free view of text. Readability maintains an advantage, though, in that its saved items remain accessible in offline mode. Of course, the same remains true of Readability competitors like Instapaper and Read It Later. 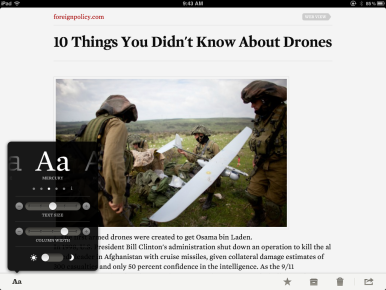 The Readability app is free and universal, optimized for both iPhone and iPad. It is compatible with devices running iOS 4.2 or later. Readability's workflow is very simple, and the minimalistic design of both the website and the free universal iOS app is consistent, eye-pleasing and easy to use.